The Craft of Veneering starts with a simple panel made from a single piece of veneer and progresses through more complex veneer assemblies like bookmatching, bent laminations, and veneering curved panels, edging, and crossbanding. At each step, all the information needed to complete the included sample projects using each of the difference methods is provided. Introduces the novice or professional woodworker to a range of veneering techniques from simple to complex that can be used to produce stunning patterns that would be impossible to achieve with solid wood. Outlines all the tools and techniques you'll need to work with veneer (including vacuum bagging and using clamps and cauls). 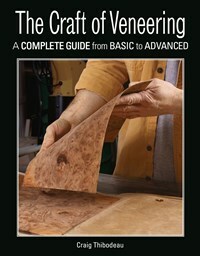 Includes chapters on the fascinating arts of marquetry and parquetry. An illustrated appendix presents enlarged photos of 37 species of wood veneer. Veneer can be incorporated in a variety of ways into furniture construction and other woodworking projects and encompasses a whole range of technical complexity. Everything about using veneer—from how it's made, why to use it, how to use it, and how to combine various techniques to create exciting new work—is explained and lavishly illustrated. Craig Thibodeau has been a professional furniture maker specializing in veneering and decorative inlay for the past 16 years and has won numerous awards for this furniture (his work can be seen at www.ctfinefurniture.com). His how-to articles have been published in Fine Woodworking, Popular Woodworking, Australian Wood Review, and Good Woodworking magazines and his work has been featured in a variety of publications over the years.